I have really been missing these sweet fluffy piles of heaven! The illustrator and I had them for the first time years ago at IHOP. I have not eaten them in years due to them being laden with lactose (I know, the nerve of them!). 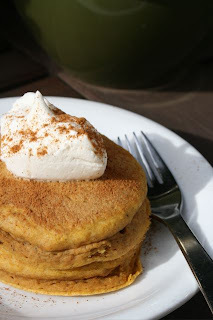 So, what do you do when you neeeeeeeed pumpkin pancakes. I mean, I am not just talking about a want, we have now come to need them! You search for what looks like a good recipe and experiment. Honestly though, how can you go wrong with pumpkin, sugar, flour and pumpkin pie spice? I found this wonderful recipe here and made a few changes to suite what I had and perfection was complete! They were heaven on a plate and still light and fluffy when reheated the next day! I have to go...heaven awaits! 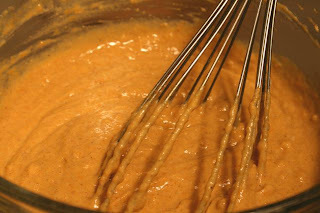 In a large bowl, whisk together the first six ingredients (flour through spices). In a separate bowl, whisk together the last six ingredients (buttermilk through brown sugar). Pour wet ingredients into dry ingredients and blend together with a wooden spoon until just combined. Lumps are ok, just make sure all the flour on the bottom of the bowl is mixed in. If batter seems too thick to pour, you can gently stir in a little more buttermilk. 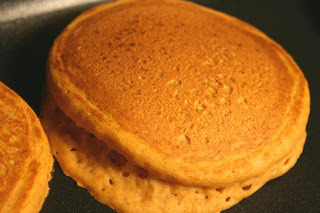 Drop pancakes by 1/4 cup onto a medium-hot griddle. Pancakes are ready to turn when the edges start to look a little dry and you can see small bubbles forming on the surface. I just baked some pumpkin muffins - but pumpkin pancakes?? WOW do those sound good - yum!! Liz, you have to try them! They are so delicious! Oh my... those look very tall! Delicious. I will have to give a try. Alisa, they are so good and good for you too! How can you beat that?? Ooooh, I would love to try these! They look so light and fluffy. Perfect.